Bittersweet Farm Goldendoodles - Why Choose Us? BREEDER STANDARD As breeders, we are dedicated to raising and training the best Goldendoodles possible. We hold ourselves to a high standard, therefore, we hold our adoptive families to the same standard. We screen clients in order to find the perfect families for our puppies. We invest so much into the lives of our puppies from well before they were born until the time they go to their forever families. We will only allow our puppies to go to loving families that are committed to their puppy for their lifetime. OUR PARENT DOGS Our parent dogs come from some of the nicest breeding lines in America. Bittersweet Goldendoodles have a very distinctive look and can be easily recognized by their beautiful blocky heads and outstanding overall beauty. Aside from being exceptionally beautiful, our parent dogs have hip clearances and full genetic testing to ensure that our puppies have the lowest possible incidence of health issues. All of the parent dogs begin their lives here as family pets that are loved and socialized from birth. REPUTATION FOR EXCELLENCE: We bred our first litter of Goldendoodles well over a decade ago. We have extensive experience and knowledge with the breed. We are dedicated to learning everything that we can about Goldendoodles. 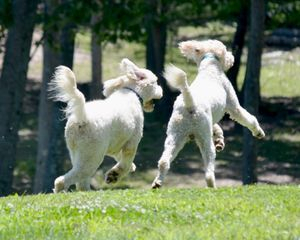 Many of our puppies owners have come back for a second doodle, and in a few instances, even a third. Most of our advertising is through word of mouth from our many happy clients.